My characters aren't dichotomous. 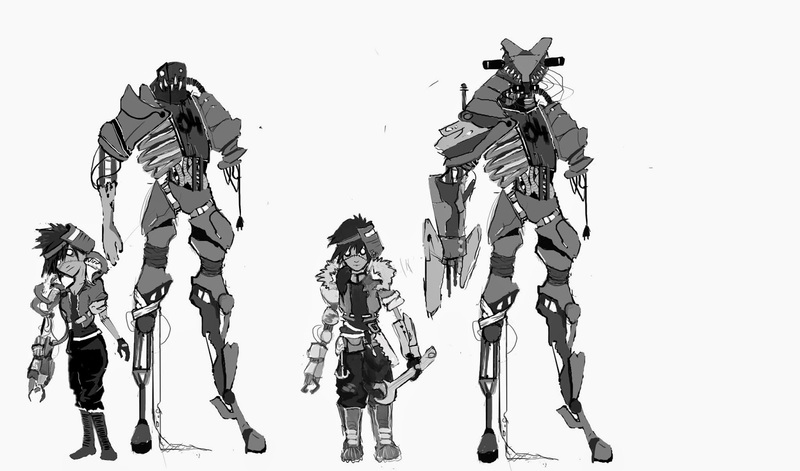 It took me drawing out my 'final' designs to realize it, but I have. I immediately tried to adapt my designs to be more contrasting, I experimented with cute/creepy, smart/dumb, and other opposites that could be applied to by already existing designs. I tried rolling with cute/creepy but by the time I was finished I was sick with dread on even justifying it as a design. It felt like it lost all it's character and charm. I didn't like the robot as a scary character and likewise the girl who was representative of darker and more unsettling characteristics herself. I backtracked and tried to just work with what characteristics they already had and just reemphasize them more. I think I settled on a sweet spot- cynical and tired verses young and wide eyed. I think this comes across despite one being a robot... I also tried to make better use of shapes; sharp and hard edges and smooth round curves to create more dichotomy. For a quick fix I think there is some significant dichotomy, I only wish there was more time for me to draw the pair out nicely, but even without our (very much appreciated) weeks extension- there's still no time. 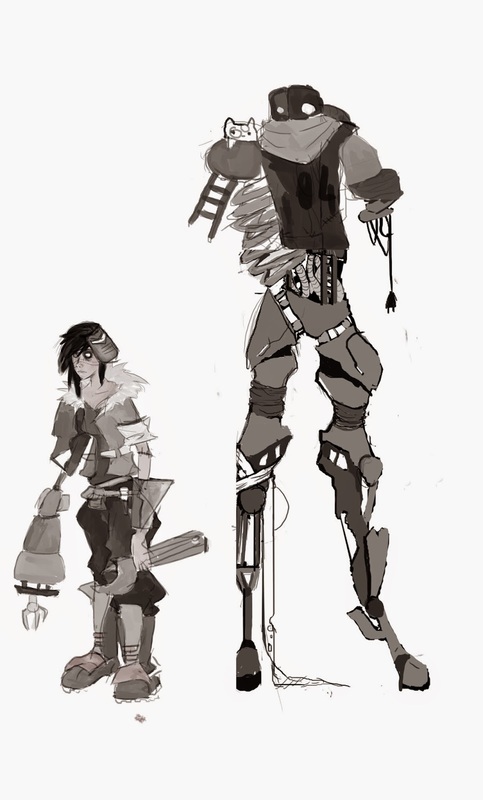 I'm already way to far into the project to still be concepting but the redesigns took out a huge chunk of this week that should have bee spent modelling. I'm still trying to claw out of this deep self loathing 'I missed the point of the project' pit... again! This is clearly not my project. In between choosing which ideas I hate the least, I also managed to put together some colour themes. I thought it would be a nice step to have before colour schemes, basically just gathering a load of images that had a nice palette, so I can get an idea of what colour scheme I want to use. I asked people around which ones they like so I could work in on a few of the popular ones. 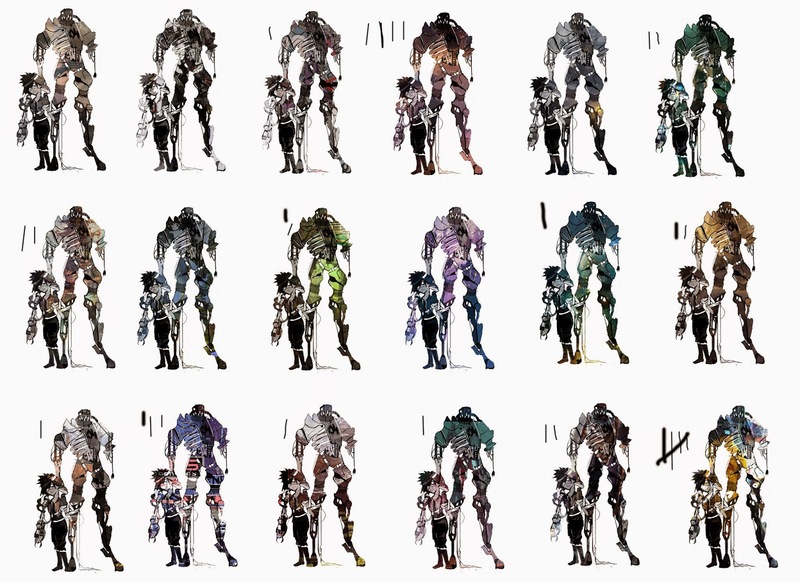 A particular design choice I made to help enhance the dichotomy was to have the two at contrasting ends of the colour wheel, only to be connected by the girls arm which would be made of the same material and colour as the robot- to bring the design together as one unit. I like to think that they do look like they belong together in the same universe because of some shared features like the eyes and strong use of triangles. In the meantime I finally started modelling, and with no proper orthographies to speak of, I'm using an actual person for proportional values so I can get them correct and then edit them to match my designs. 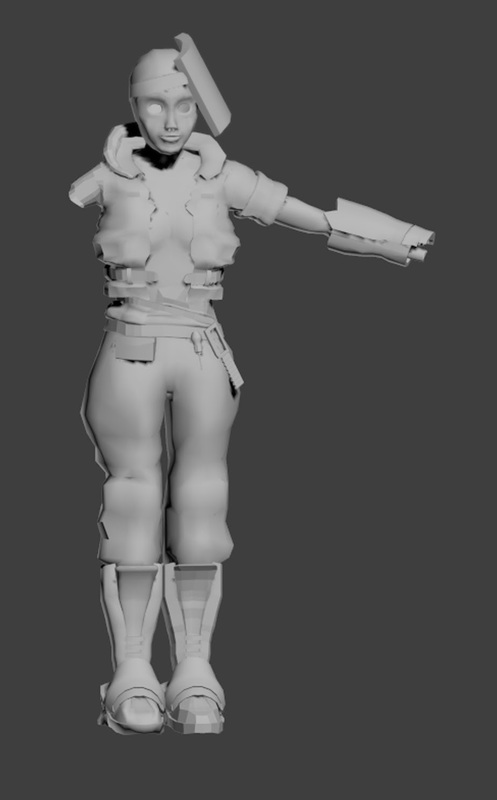 I'm finding modelling clothes particularly difficult and am having some troubles keeping it low poly, I'm also at a stage where I have no idea how I'm going to do the fur or hair. On one hand I think using alphas wouldn't look as effective or adhere to the design as much, however it is a more standard and budget conscious method I think I need to be wary of this as the tri count is looking quite high already. It was also incredibly irritating to do the trousers which are supposed to be incredibly baggy and add allot to the shape, but I ended up having to neuter them down significantly because it kept clipping between the legs, ruining any future rigging potential. Also when I tried to make them larger on the outside, it looked ridiculous. I had more luck with the head, which I am cautious to say I'm quite pleased with, but I'm apprehensive because maybe my standards have been lowered so viciously that any small victory seems like an enormous relief. I liked that I managed to get the stylistic nose tilt that makes the character look younger, it also makes the big round eye sockets even larger by comparison, which is good since the eyes are meant to unsettle you, in contrast to the almost 'cute' face. 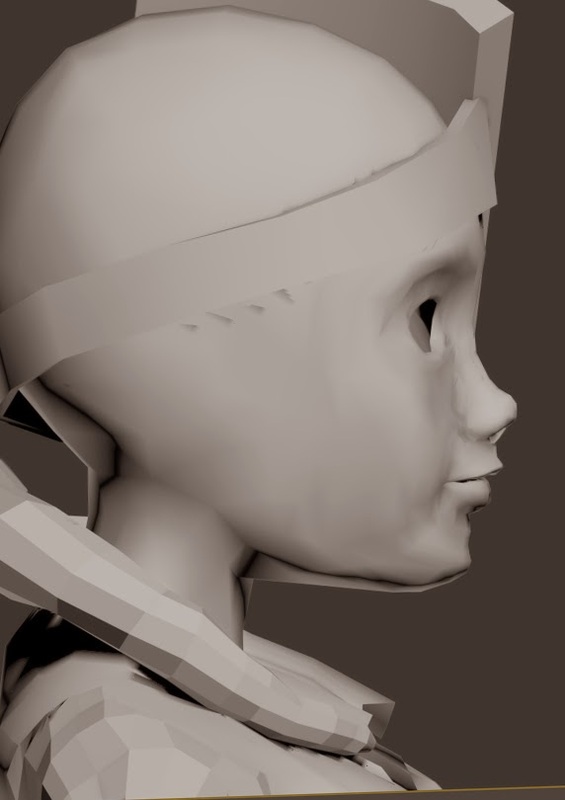 Next week will be a huge push to finish the whole thing, it's disastrous that I'm even this far behind in the first place, but |I don't feel it's impossible just yet, as long as I keep up the pace and finish modelling within the next day or so. There'll be some late nights, I can tell.